A twist on a familiar adage amongst water managers is “when it rains, it drains.” While not unique to Pennsylvania, in suburban and urban municipalities, centuries of strong growth, including recent decades of sprawl, have transformed much of the state’s natural land cover into extensive impervious surface. As a result, instead of soaking into soils and groundwater, stormwater drains directly into rivers and streams contributing to — and often exacerbating — flooding and pollution. 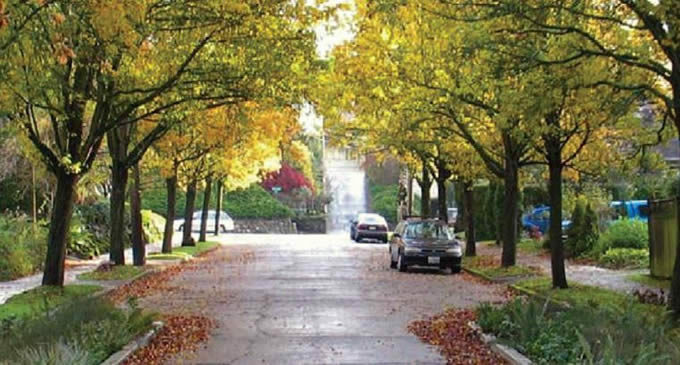 The ideal approach to resolving the adverse impacts of stormwater would be to return the landscape to its natural cover. A highly cost-effective, efficient, and viable solution is to adopt “green” infrastructure practices that protect, restore, and replicate nature’streatment of stormwater. Green infrastructure includes low-impact development practices at new and re-developing sites, and the incorporation of features such as rain barrels, green roofs, and permeable pavement on already-developed sites. Green infrastructure is becoming widely understood and accepted, and is being implemented on the ground in cities across the nation, including Pittsburgh and Philadelphia. The challenge to broader implementation in smaller municipalities throughout the Commonwealth is ensuring that regulatory, management, and funding institutions work in concert to promote the use of green infrastructure. To begin with, Pennsylvania is challenged by historical patterns of funding water management that have prioritized wastewater treatment and drinking water delivery over stormwater management. Traditionally, funding also has favored hard structural solutions to management (known as “gray” infrastructure) rather than nonstructural or “green” practices that address the problems associated with runoff at its source. Further, regulation of stormwater management has failed to sufficiently integrate greener solutions and to promote nonstructural practices in the management of Pennsylvania’s water resources. The unfortunate result is that Pennsylvania has received a failing grade for its management of stormwater. In 2009, the Chesapeake Stormwater Network ranked Pennsylvania last of five Chesapeake Bay states on its Baywide Stormwater scorecard. With an overall grade of “D” for implementing a stormwater program that meaningfully protects and restores the Bay, Pennsylvania received an “F” with regard to its funding of stormwater management needs to address the 21st century challenges posed by aging and deteriorating infrastructure, increasing demands on water use, and impacts of a changing climate. It is imperative to seize this chance to make progressive and institutional “green” investments to avert “pouring money down the drain.” Pennsylvania’s rivers and communities depend upon clean water and require a swift remedy to current infrastructure woes. “Green” solutions have the added benefit of facilitating the resilience rooted in nature that communities need to adapt to the impacts of climate change on vital freshwater resources. Towards those ends, American Rivers has investigated the capacity of Pennsylvania’s funding institutions to support efficient and cost-effective green infrastructure practices to enhance sustainable water management over the long term. 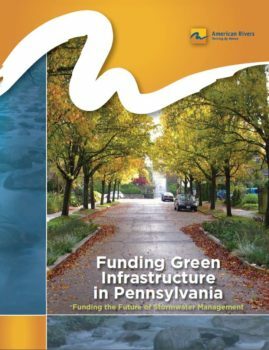 Our findings highlight several recommendations for formalizing funding for green infrastructure that will help Pennsylvania municipalities achieve clean and abundant supplies of fresh water for healthy communities and future generations. These recommendations will facilitate efficient and cost-effective green practices to address Pennsylvania’s stormwater management challenges. The results will yield benefits in the form of reduced tertiary treatment costs, decreased flood damages, and healthier ecosystems and communities throughout Pennsylvania that are also better prepared to adapt to a changing climate.